One of the most important phases of a good dragon boat stroke is the catch and it is one of the most difficult to master. The catch involves the burying of the full face of the paddle into the water before you begin the drive. But just burying it is not enough – it has to be buried quickly. Since the boat is moving, a slow bury of the paddle could mean that your stroke is almost over before you start the power phase of your stroke. That is why you see elite dragon boaters aggressively drive their blade into the water at the front of the stroke. 90% of dragon boaters look spectacular as they set up for the catch. 90% of paddlers then proceed to undo all the good work by missing the catch. The graphic above shows how not to catch. Notice how much of the stroke has passed before the paddle is buried? Here the paddle is driven into the water quickly, before the drive is executed. Notice that the paddle is still traveling backwards as it is being driven in. It needs to. If the paddle doesn’t move backwards then it is checking the boat which is undesirable. The secret to a good catch is get it in deep, get it in quickly. Is using gravity good enough? If you let gravity take over and you drop into the water from set up, then it will take about 0.3 seconds to bury the face of the paddle. Considering that the total amount of time that your paddle is in the water during a stroke could be less than 0.6 seconds, using gravity means the paddle is only buried properly for half of the stroke. Also not many would actually let their body drop freely in the fear that they would crash into the gunwale, so they tend to hold back. So in this case, the actual bury time is longer than 0.3 seconds. While the paddle is being buried, it is also moving backwards due to the flow of the passing water. The longer it takes to bury, the further the paddle moves towards the back of the boat, leaving less time and distance for the drive phase. Considering that most of the leverage is at the front of the stroke, every centimetre missed at the front of the stroke is power missed. If you drive the paddle in for the catch rather than use gravity you can bury the paddle faster. Burying the paddle faster means there is more time and length of stroke left for the power phase. The secret here is controlled aggression. Driving the paddle in with a big splash or while checking the boat or with too aggressive body movement will undo all the advantages of the extra power stroke length. And just as importantly, this needs to be a whole boat thing. Ideally everyone needs to execute the same catch at the same time. You are using more of the leverage at the front of the stroke. Check out the video below. The full video can be found here. I have taken a section of the video and slowed it right down. This is a fairly good catch and yet note the distance from the initial touch of the blade on the water and when it is fully buried. When you are next on the water, check your own catch because in a later post, I will discuss how to tune your catch to squeeze even more out of your stroke. Mark. This is a lucid description of what’s a good catch. But the forward acceleration graph and video of the stroke are poor examples. 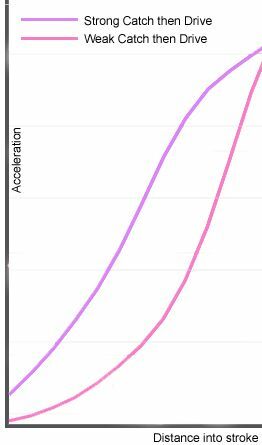 The graph the acceleration/deceleration ratio is about 40/60. i would expect paddlers to be propelling the boat at least 50% of the time. Similarly the video clip of 22dragons.com shows the paddle is at a severely negative angle for 75% of the time of the drive. During this time, a large portion of the pulling force is pulling the hull down which is highly inefficient. The increased drag will slow the boat by 1-2 seconds. Hi Jacob, Like you, I have an idea of the graphics and video clips of what I believe a good stroke looks like. Until I can get some (or make them myself), I have to rely on what is out there. This post is about the catch so the images I have chosen are focused mainly on that aspect of the stroke. But thanks for your feedback. Keep an eye out for future posts that detail a more complete description of a full stroke. Hi Tim. Thanks for your reply. Yes, finding the right words for the catch is tricky. Maybe “controlled aggression” is a better description. Your words of “assertive, purposeful, patience” also set up a good mental picture of the catch. Maybe this problem with describing it, is why it takes so many so long to get it.